Take a step into the future of tire management with the ContiEarth™ intelligent tires, saving the need for extensive manual checks and optimizing the life of your tires. 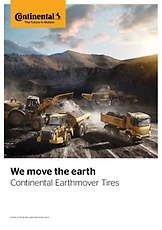 All Continental Radial Earthmoving tires are equipped with premounted sensors which constantly monitor inflation pressure and temperature of the tire and transmits the information in real time to the ContiPressureCheck™ system. The sensors mounted inside the tire provides real-time information and guarantees greater data accuracy than comparable products. A continuous tire monitoring will reduce tire related breakdowns and vehicle downtimes and therefore increases the efficiency of the vehicle and your fleet. The data can be read out through the hand-held tool or displayed in the driver cabin.